With big data usage growing exponentially, many Kubernetes customers have expressed interest in running Apache Spark on their Kubernetes clusters to take advantage of the portability and flexibility of containers. Fortunately, with Kubernetes 1.2, you can now have a platform that runs Spark and Zeppelin, and your other applications side-by-side. 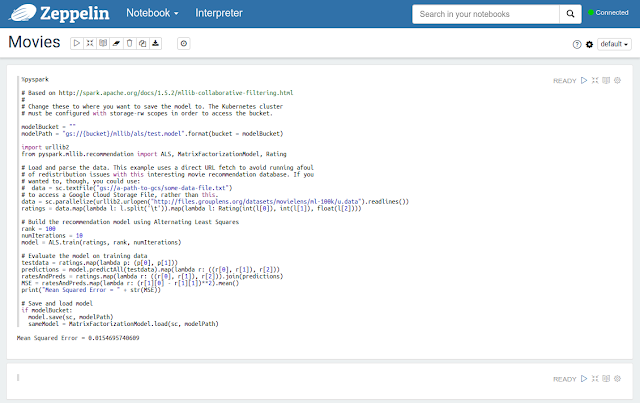 Apache Zeppelin is a web-based notebook that enables interactive data analytics. As one of its backends, Zeppelin connects to Spark. Zeppelin allows the user to interact with the Spark cluster in a simple way, without having to deal with a command-line interpreter or a Scala compiler. So why would you run Spark on Kubernetes? A single, unified interface to your cluster: Kubernetes can manage a broad range of workloads; no need to deal with YARN/HDFS for data processing and a separate container orchestrator for your other applications. Increased server utilization: share nodes between Spark and cloud-native applications. For example, you may have a streaming application running to feed a streaming Spark pipeline, or a nginx pod to serve web traffic — no need to statically partition nodes. Isolation between workloads: Kubernetes’ Quality of Service mechanism allows you to safely co-schedule batch workloads like Spark on the same nodes as latency-sensitive servers. Note: We’re using n1-standard-4 (which are larger than the default node size) to demonstrate some features of Horizontal Pod Autoscaling. However, Spark works just fine on the default node size of n1-standard-1. ‘kubernetes/examples/spark’ is a directory, so this command tells kubectl to create all of the Kubernetes objects defined in all of the YAML files in that directory. You don’t have to clone the entire repository, but it makes the steps of this demo just a little easier. You can see that Kubernetes is running one instance of Zeppelin, one Spark master and three Spark workers. This establishes a secure link to the Kubernetes cluster and pod (zeppelin-controller-t1njl) and then forwards the port in question (8080) to local port 8080, which will allow you to use Zeppelin safely. Now that I have Zeppelin up and running, what do I do with it? For our example, we’re going to show you how to build a simple movie recommendation model. This is based on the code on the Spark website, modified slightly to make it interesting for Kubernetes. You can now click the Play button, near the top-right of the PySpark code block, and you’ll create a new, in-memory movie recommendation model! In the Spark application model, Zeppelin acts as a Spark Driver Program, interacting with the Spark cluster master to get its work done. In this case, the driver program that’s running in the Zeppelin pod fetches the data and sends it to the Spark master, which farms it out to the workers, which crunch out a movie recommendation model using the code from the driver. With a larger data set in Google Cloud Storage (GCS), it would be easy to pull the data from GCS as well. In the next section, we’ll talk about how to save your data to GCS. For this demo, we’ll be using Google Cloud Storage, which will let us store our model data beyond the life of a single pod. Spark for Kubernetes is built with the Google Cloud Storage connector built-in. As long as you can access your data from a virtual machine in the Google Container Engine project where your Kubernetes nodes are running, you can access your data with the GCS connector on the Spark image. You’ll need to change this URI to something that is unique for you. This will create a bucket that you can use in the example above. Note: Computing the model and saving it is much slower than computing the model and throwing it away. This is expected. However, if you plan to reuse a model, it’s faster to compute the model and save it and then restore it each time you want to use it, rather than throw away and recompute the model each time. Spark is somewhat elastic to workers coming and going, which means we have an opportunity: we can use use Kubernetes Horizontal Pod Autoscaling to scale-out the Spark worker pool automatically, setting a target CPU threshold for the workers and a minimum/maximum pool size. This obviates the need for having to configure the number of worker replicas manually. To see the full effect of autoscaling, wait for the replication controller to settle back to one replica. Use ‘kubectl get rc’ and wait for the “replicas” column on spark-worker-controller to fall back to 1. The workload we ran before ran too quickly to be terribly interesting for HPA. To change the workload to actually run long enough to see autoscaling become active, change the “rank = 100” line in the code to “rank = 200.” After you hit play, the Spark worker pool should rapidly increase to 20 pods. It will take up to 5 minutes after the job completes before the worker pool falls back down to one replica. In this article, we showed you how to run Spark and Zeppelin on Kubernetes, as well as how to use Google Cloud Storage to store your Spark model and how to use Horizontal Pod Autoscaling to dynamically size your Spark worker pool. This is the first in a series of articles we’ll be publishing on how to run big data frameworks on Kubernetes — so stay tuned! The Big Data “Special Interest Group,” which meets every Monday at 1pm (13h00) Pacific Time at SIG-Big-Data hangout And of course for more information about the project in general, go to www.kubernetes.io.